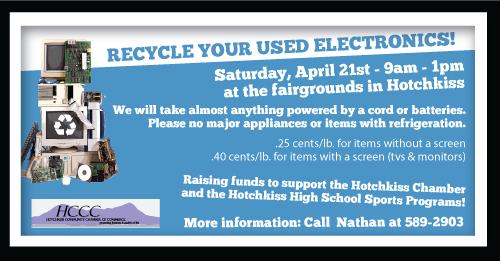 The Hotchkiss Community Chamber of Commerce holds an annual E-waste collection event in Hotchkiss each spring, in cooperation with Double J Disposal of Austin and Recla Metals of Montrose. The event’s purpose is to provide area residents an outlet for responsibly disposing of electronic waste that is banned from landfills. All E-waste is disassembled and recycled in the United States in compliance with American environmental and labor standards. The event also serves as fundraiser to help support the mission of the Chamber… “To support and promote the economic strength and viability of Hotchkiss, Colorado, and surrounding areas, in a manner which is deemed to be harmonious with the social interests of the community”. Computer equipment: CPUs (towers), monitors, routers, laptops, tablets, iPads, e-readers, etc. Computer peripherals: Keyboards, mice, speakers, cords, etc. (no CDs, or floppy disks). Printers: Ink jet, laser, dot matrix – all sizes. Large office equipment: Copy machines, routers, plotters, multi-purpose printers. Small office equipment: Adding machines, calculators, fax machines, scanners, external hard drives, etc. Phones: Desk phones, wall phones, cell phones. Televisions: All sizes and types. Video players: DVD, VCR, cable boxes, video cables, etc. Video equipment: Digital cameras, camcorders. Video game consoles: Gameboy, Nintendo, Play Station, X-box, Wii, etc. Audio equipment: Receivers, CD players, cassette decks, 8 track tape players, record players, speakers, MP3 players, iPods, audio cables. Batteries: Laptop, UPS back up, household (no vehicle batteries). Small kitchen appliances: Toasters, toaster ovens, microwaves, mixers, blenders, can openers, hot pots, electric burners, coffee pots, etc. Small household appliances: Vacuum cleaners, electric toothbrushes, floor/table lamps, fans, etc. Handheld power tools: Circular saws, sanders, drills, electric screwdrivers, nail guns, etc. Nothing with refrigerants (refrigerators, freezers, air conditioning units. Stoves, Dish washers, water heaters and other major appliances. Fees: .25¢/lb. for items without a screen/monitor. .40¢/lb. for items with a screen – televisions, computer monitors, laptops. We accept cash or checks as payment. Checks should be made to Hotchkiss Community Chamber of Commerce. For a pdf of this information, please click here.